Are there any realistic hot planet textures for hot exoplanets? I am asking because the usual "glowing dimly red" textures for Celestia are totally unrealistic. 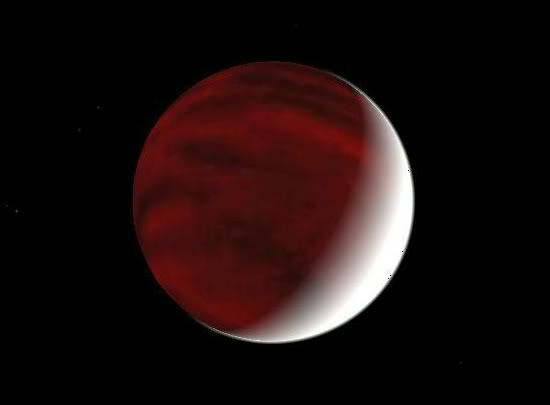 A hot Jupiter would be brilliant white on the dayside and bright orange on the nightside http://oklo.org/2005/12/05/i-wear-my-sunglasses-at-night/ not the faint glow commonly depicted in Celestia plugins or "artist's impressions". Anybody knows of any realistic hot planet textures (I am asking for hot planet ones because they are most commonly discovered due to being easy to find and a lot of them have been discovered)? It wouldn't be hard to actually just make them. Apply a pure white texture to the dayside, and then give the night side a well-lit red texture. I've found adding an atmosphere with mie in makes the day-side look nicer, too. I don't think a pure white texture would be so realistic. White hot, but with features, after all, compared to the main star it is still dim. The dayside would probably look like the surface of a cool star. Care to give us a visual of what you're thinking? I must admit a certain hangup on my part about things being "correct," ie, making the atmosphere the "right" color based on its composition, or the "right" surface based on a planet's mass or what not. He provided this image as a link in his post. I, too, am rather fond of it as a realistic representation of what a hot Jupiter should look like to the human eye. Here is that Celestia imitation I mentioned, inspired directly by the hot Jupiter image in that Oklo.org post. I think it depend of the sensibility of the eye or the camera to the light. 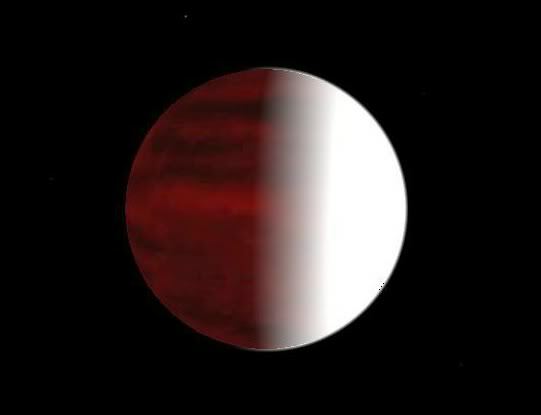 The atmophere of some hot jupiters is almost black,. But because the planet is very close to their sun, the ~3% of reflected light is sufficient to saturate our virtuel captors. It's just like sunspots: their are almost white, but if you have an instrument able to dimming the light from the planet, I think you can obtain a photography like the representations of sudarky classes of exoplanets. Thanks for answers, and Stalker, your English is excellent, I am from Slovakia so it is not like I am going to bully people for the quality of their English . Sirius_Alpha wrote: He provided this image as a link in his post. Question: From the perspectives depicted in these pictures, how bright might a hot jupiter's dayside appear to be to the naked eye when compared to Sol as seen from Earth and/or the said hot jupiter's sun? Granted, as stated a few posts above me, albedo may play a role in it. Question is what exposure level to render it at. Unfortunately Celestia does not have the high dynamic range capability to do justice to a hot Jupiter. AFAIK, hot jupiter are supposed to have sodium and sillicate clouds so... not blue. By the way, can anyone do a good depiction of the Kepler 20 system please? Edasich, NuclearVacuum, Stalker? Or somebody else? For a couple planets (Ups And b and HD 189733 b? ), we have a few lines of evidence pointing to the planets being blue. From polarimetry I think. Don't quote me on that as I'm not particularly sure. How this plays into the supposition of silicate and sodium clouds, I am not sure. From this paper it seems like Upsilon Andromedae b and HD 189733 b are blue in colour, similar to Neptune with additional absorption probably from Na and TiO. • The limits obtained on the geometrical albedo indicate reflective properties [for Upsilon Andromedae b] like in HD189733b. Both these hot Jupiters reflect most efficiently blue light and shine similar to Neptune in the Solar system. Their average optical albedo is close to that of Kepler-7b. It is possible that their high re-flectivity is due to high-altitude haze. • Combining the polarimetric albedos with those evaluated from optical spectroscopy and photometry for a sample of planets, we obtained a unified picture of the geometrical albedo of an average hot Jupiter. Its albedo can be as high as 0.6 in the near UV and close to zero at wavelengths longer than 700 nm. A broad absorption centred at 550 nm, probably due to TiO and Na ɪ, can strongly influence an average optical albedo of hot Jupiters. Sodium has been detected in atmospheres of evaporating hot Jupiters. And Sudarsky predicts blue gas giants to end at cca 630 degrees Celsius. What you are thinking of is "clarified jovian" class in late John's work and it applies to "intermediately" hot gas giants, not really hot Jupiters. The Sudarsky papers are just one set of theory. It should not be taken as gospel. Reality does not have to follow the theory. I know, but Tres-2 was measured to be extremely dark, for example, fulfilling the Sudarsky predictions. There does seem to be variability in the strength of the absorption feature at ~500-650 nm which changes the overall albedo, but as pointed out in the paper the albedos typically are higher in the ultraviolet and very low in the infrared, giving an overall blue colour. Note that the TrES-2 measurement is for a single band-pass, it does not have sufficient information to determine the colour. (This is a limitation of using Kepler that uses only one band-pass).